September has arrived and that means fall is quickly approaching. It’s time to trade in the beach chairs and sunscreen for sweaters and scarfs. As we reluctantly say goodbye to summer and watch the leaves change from green to red, the flavors of fall are something we all can anticipate. 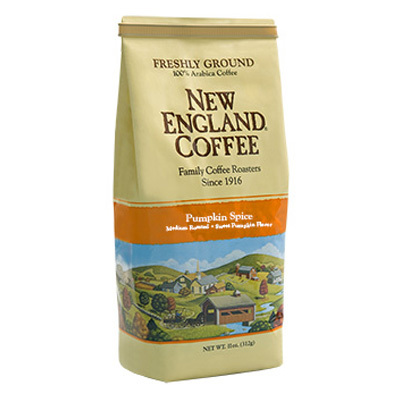 At New England Coffee, we welcome autumn with a warm cup of Pumpkin Spice or Caramel Apple coffee! Our Pumpkin Spice coffee bursts with warming flavors of cinnamon, clove, ginger and nutmeg; while our Caramel Apple coffee has hints of both sweet caramel and tart apples. To really capture the flavors of fall and make the most of this season’s harvest, we’ve compiled some unique and delicious recipes that highlight our favorite seasonal ingredients. This Caramel Apple Coffee Cake is a twist on a classic coffee companion. With the addition of tart Granny Smith apples and a rich caramel drizzle, this recipe is fall must. If you prefer pumpkin over apples, we’ve got you covered with this Pumpkin Pie Coffee Cake. Creamy pumpkin puree and a sweet and crunchy pecan streusel topping make for a perfect seasonal treat. With pumpkin pie on the mind, we love the idea behind these Pumpkin Pie Cupcakes. It’s a perfect way to share this classic fall favorite in a single serve portion. Pair these cupcakes with our single serve Pumpkin Spice K-Cup Pods to get that all-around pumpkin experience. Looking for a seasonal beverage? This Apple Cider Latte recipe is a great way to combine seasonal ingredients with your daily cup of joe. Or maybe, you crave a little more caramel to satisfy that sweet tooth? If so, try this Caramel Coffee Cider recipe. For both recipes, we substituted our Caramel Apple coffee to enhance the apple flavor! For those pumpkin lovers out there, we recommend trying this Pumpkin Spice Latte. This recipe takes pumpkin coffee to another level. Replace the espresso with Pumpkin Spice coffee to maximize the pumpkin flavor. And if you’re still craving even more pumpkin in your coffee, this Homemade Pumpkin Coffee Creamer recipe is both easy and delicious. Best part, it lasts up to one week in the fridge. We hope we have inspired you to take advantage of the season’s flavors! We’d love to hear what you think of these recipes by leaving us a comment in the review section below.